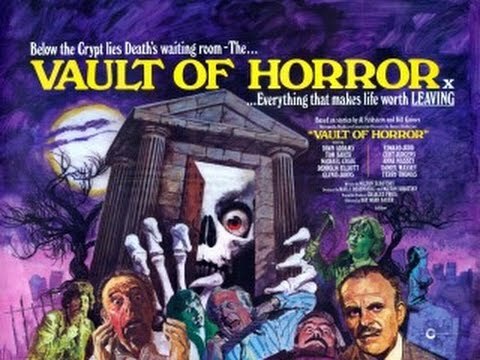 The Vault of Horror (otherwise known as Vault of Horror, Further Tales from the Crypt and Tales from the Crypt II) is a British anthology horror film made in 1973 by Amicus Productions. Like the 1972 Amicus film Tales from the Crypt, it is based on stories from the EC Comics series written by Al Feldstein. The film was directed by Roy Ward Baker, and filmed on location and at Twickenham Studios. The film stars Terry-Thomas, Dawn Addams, Denholm Elliott, Curd Jürgens, Tom Baker, Michael Craig, Terence Alexander, Glynis Johns, Mike Pratt, Robin Nedwell, Geoffrey Davies, Daniel Massey and Anna Massey. None of the film's stories are actually from Vault of Horror comics. All but one appeared in Tales from the Crypt, the exception being from Shock SuspenStories. The film omits the Vault Keeper character from the comics. I love this movie. Unfortunately, I bought it as a double feature pack with Tales From The Crypt for $5 at Walmart, and it's edited to a PG rating, so some of the gore is removed. Still, wonderful acting, great tension, and Tom Baker. Tom Baker is great in this, I thought. Another bunch of fine actors. The only complete version I have found is in 4:3 format. Bit frustrating. Yes I have the Vipco 4:3 version but I bought a widescreen version back in late 2016 by Final Cut Entertainment which retains the missing bits like the blood tap and John Witty's severed hands! Even though Peter Cushing isn't in this one I think it's one of Amicus's best films! To this day I have never been able to find or ascertain whether this was a deleted scene or a posed publicity shot. Seems to be a heavy make up job, just to stand there for the world's press. I have always been disappointed at the low key "fade away" ending compared to the creepiness of the above image. I have the bottom one and I'm not sure which is the older version, Doc! Apparently the scene with the mummified corpses walking back to their graves was not a cut scene at all but done after the film finished! The guy in the background is definitely not Curt Jurgens as you can see! Thanks JB. Believe it or not I always thought - or rather assumed - it was Jurgens, but now you have pointed it out I can now see clearly that it is not! I think the Chris Lee cover is the original one, but will have to dig em both out and check to be sure. Blimey the Lee cover must have come out prior to 1974 then because that's how long I've had the skull covered version, Doc!